Oct. 2, 2013, 9:41 a.m. The newspaper is now betting than an improved experience can get people to pay about $150 a year for digital access. By Justin Ellis @JustinNXT Oct. 2, 2013, 9:41 a.m. I want to assure you that our Subscriber Content strategy has been carefully planned and it will be diligently executed. I know that because we are fortunate to have dedicated and talented people working at our company. Are we certain this strategy will succeed? No. In fact, maybe we will be wearing that dunce cap. What will we do if the strategy fails? We will get up and try again. As a wise person once said, in times of adversity, the greatest failure of all is the failure to dare to take risks. I did say that you can always go back to free. Because you can. Yet that’s not what we are planning to do. We are planning on making this strategy work. As I said in a note to you last Tuesday, strategies need time to work. We are going to give this strategy lots of time and lots of support. You can think of the new approach as a variant of the two-site strategy that’s become popular among a set of large metro newspaper publishers. Here in Boston, you have Boston.com — free, bubbly, buzzy, webby — and BostonGlobe.com — classy, clean, sophisticated, filled with the stories published in the print newspaper, and behind a paywall. 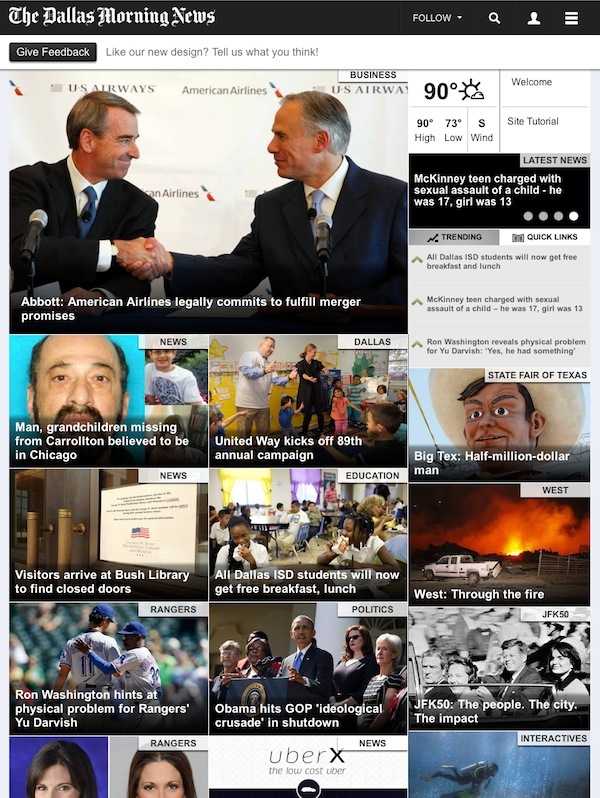 Hearst has done something similar in Houston (free Chron.com vs. paid HoustonChronicle.com) and San Francisco (SFGate.com vs. SFChronicle.com). 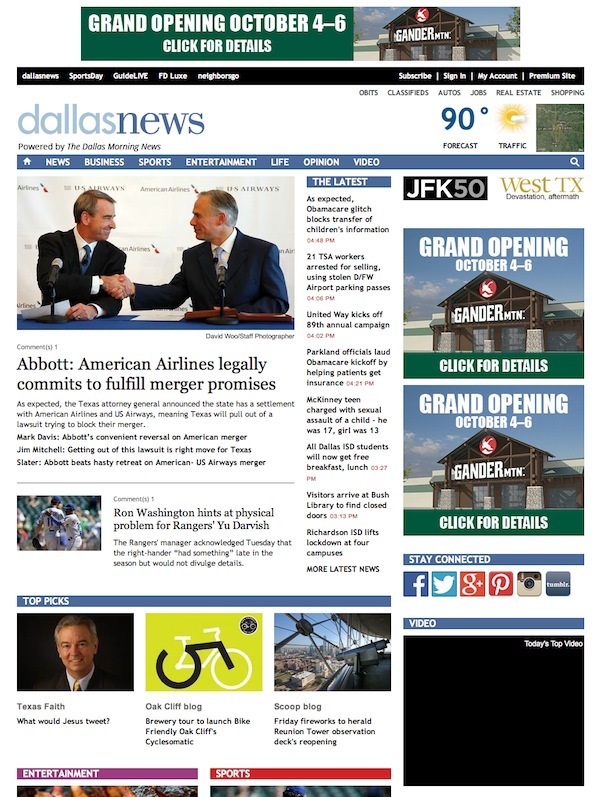 Subscribers get a DallasNews.com where the article pages have fewer ads and more stark black, white, and grey, and where the front page is reduced to a dozen or so photo rectangles. In these pairs of screenshots, the “premium” look is on top, the “free” look on bottom. Why the change in strategy? First, the newspaper has come to believe that its remaining print subscribers are highly unlikely to be lured away by digital. The paper’s chief marketing officer Jason Dyer told Ad Age that its research found “just 5% of the Morning News’ print subscribers would give up their seven-day print editions for complete digital access, even if that digital access was free.” That led to the emphasis on the reading experience — not just the content — being key. Print readers see online as a companion, not a replacement, Moroney told me, and if that’s the case, then the strategy needs to be to make something that appeals directly to a digital-only audience. The paywall strategy wasn’t showing great, business-shifting success either. The paper wouldn’t say (or tell its own reporter) how many digital-only subscribers it had accumulated under the outgoing model. “We looked up and said, Well, we have a nice digital-only business of sorts, but it’s not the robust business that our print subscription base is,” Moroney said. “We did not see a continuous growth going on in digital-only subscribers, and where it began to plateau out for us, at least in this juncture, was not what we thought was a robust enough digital-only subscriber base to warrant saying, Okay, great, let’s keep doing this,” he said. Putting all stories outside of a paywall increases the number of impressions available to sell to advertisers, which may mean an incremental increase in digital ad revenue, Moroney said. But that alone won’t help the paper’s bottom line, which is why Moroney wants the paper to experiment with new types of advertising and new lines of business. POSTED Oct. 2, 2013, 9:41 a.m.
Ellis, Justin. 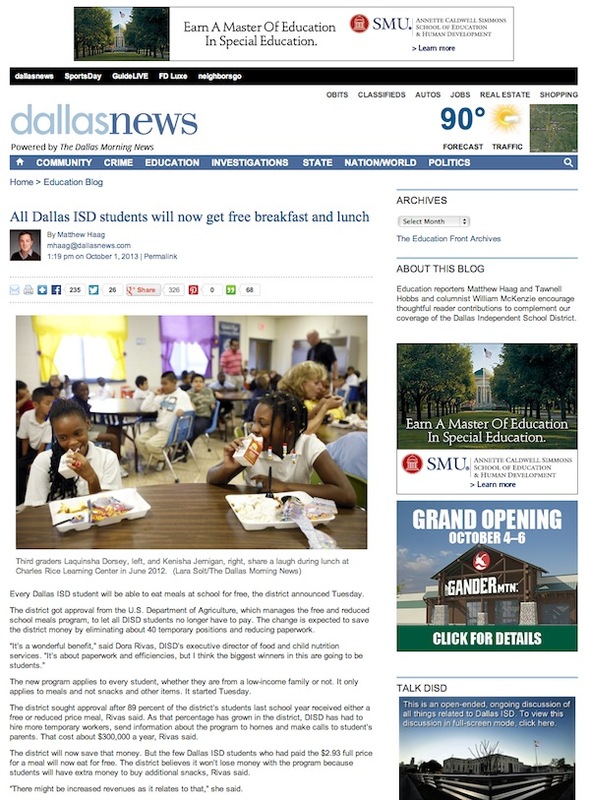 "The Dallas Morning News dismantles its paywall in favor of a bisected reader experience." Nieman Journalism Lab. Nieman Foundation for Journalism at Harvard, 2 Oct. 2013. Web. 18 Apr. 2019. Ellis, Justin. 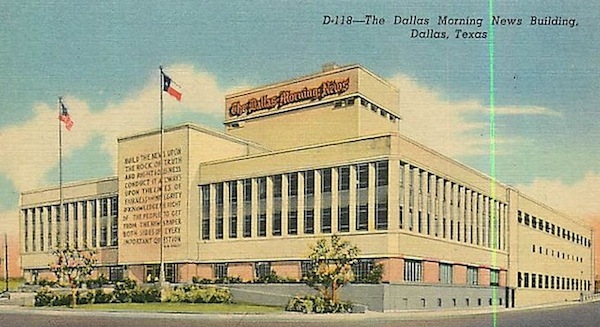 "The Dallas Morning News dismantles its paywall in favor of a bisected reader experience." Nieman Journalism Lab. Last modified October 2, 2013. 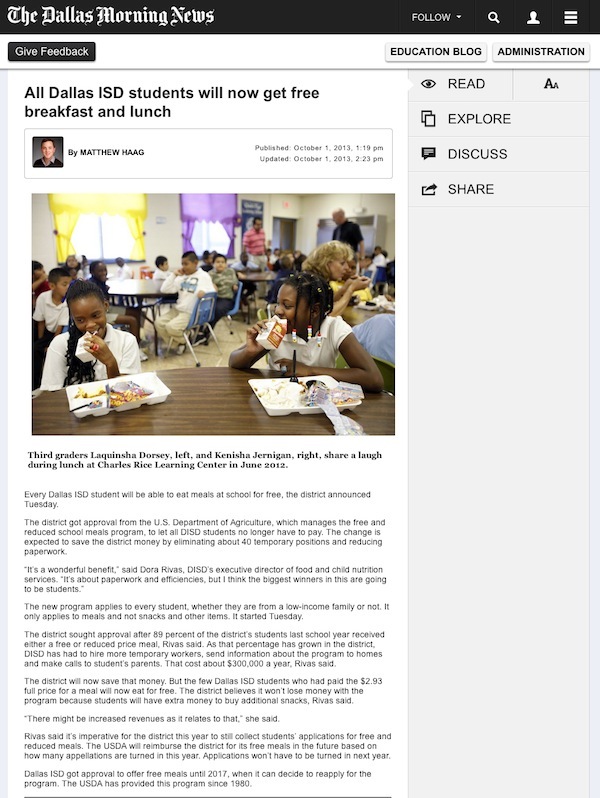 Accessed April 18, 2019. https://www.niemanlab.org/2013/10/the-dallas-morning-news-dismantles-its-paywall-in-favor-of-a-bisected-reader-experience/.